Thank goodness that's all over! 2008 that is. Since Thanksgiving we have been in a maelstrom. Thanksgiving was at our place with all the US family except Air Force grandson in Wyoming and middle daughter slaving away in England. Turkey (or cook - me) was sub-standard but most everything got eaten anyway so I still claim it as a win. Then the weather went really bad - cold, cold, cold, so we snuck off to the Caribbean for a while to hasten the onset of Christmas - blogs coming up. Christmas was also at our place, this time with middle daughter but still without USAF grandson. Turkey was great and, after everything was eaten, everyone went home. Funny how that works. Pictures here for the bravehearted. England daughter went back to the old country so we left town for the winter. So far, made it to Macon, GA but still have not escaped the winter - 31 degrees tonight, quite a hoot this far south to see the locals deal with such frigid times. Monday, the Lazydays' blacksmiths will continue hastening the entropy of our coach as they blunder their way through our punch list. Given that they get done before April we will be heading somewhere, otherwise we'll be heading home. At least there will be a chance to catch up on '08 blogs. Do have a GREAT 2009! Continuing with our 2008 trundle around Europe, we decided to head east from the Atlantic coast and the tawdry town of Barra and get back to Spain which, by now, had started to look quite attractive. 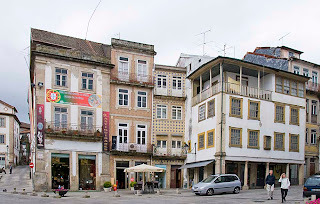 About halfway across, on the A25 road, is the city of Viseu. The Romans kept a 90 acre garrison on the hilltop that eventually became Viseu. In the 6th century, the Suevi tribe of the Vandals drove the Romans off and installed a Catholic regime on the area. The Visigoths, in turn, frightened off the Vandals in the 7th century but shortly thereafter, were themselves ejected by the Moors. The Moors hung in until the 12th century when King Alfonso V of León drove the Moors away and annexed the area into the County of Portucale. Later, when Dom Afonso invented the Kingdom of Portugal, Viseu became part and of it. Check out a few of the local sights here. European camping is so very different from the leisurely, made in the shade luxury we enjoy here in the US. It's not that it's bad, it's just different. Check out some of the "sites". May 20th, 2008 - Barra, A Day at the Beach! About halfway down the coast of Portugal there is a large sand bar that forms a complex of intra-coastal waterways. 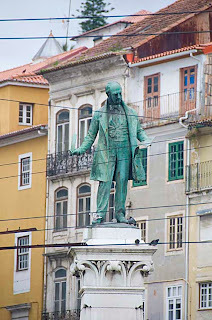 In 1932, the Big Cheese of Portugal, Presidente da Republica General Antonio Oscar de Fragoso Carmona Iancou, solemnly laid the first stone of a monument commemorating the development of the area. Subsequently Praia Barro (Barro Beach) and Costa Nova (New Coast) grew into laid back communities of low cost housing. In the last few years however, everything has changed - this rustic area was "discovered" and quickly sprouted high rise holiday homes and yuppie cafes while the waterways filled with leisure boats and the low cost houses were tarted up to imitate holiday homes. Each to his own. Additional scenes from paradise here. Our Coimbra day was one of those occasional days when we should have stayed in bed. "Big Cityed" out, horrible humidity, on and off rain and no possible chance of parking near the good stuff all combined to render a unamimous decision for a short visit. We took a slothful stroll along the river, rubbernecked a while and left. 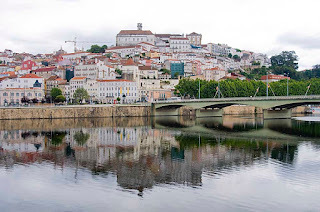 Coimbra is the seventh largest city in Portugal and is number seven of just eight cities that have a population over 100,000. The University of Coimbra, with 23,000 students on campus, many of them international, was founded in 1290 and is the oldest academic institution in Portugal and one of the oldest in Europe. A further 12,000 students attend other higher education institutions giving the town an energetic and cosmopolitan atmosphere. The city contains important archeological remains, including a well preserved aqueduct, from the time when it was the Roman town of Aeminium. 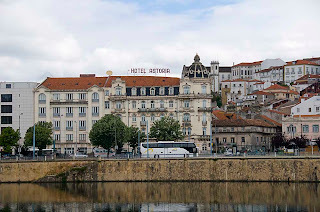 Built on a hill near the river Mondego, Coimbra is located near the Atlantic coast, 70 miles south of Porto, 120 miles north of Lisbon and about 25 miles inland. Around 600 CE, the Visigoths kicked the romans out before being vanquished themselves by the Moors in 711. Five hundred and fifty years later, in 1064, Ferdinand I of León booted the Moors out - score one for the Christians! 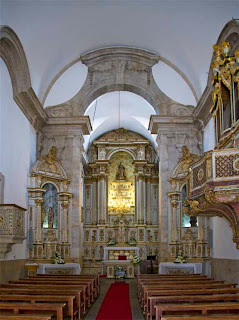 Several extant monuments such as the Old Cathedral, the Church of St. James and the Santa Cruz Monastery date back to the period commencing with Ferdinand I. Some remnants of the original city wall fortifications are stll visible. Lots of great sights in Coimbra from all reports - kinda sorry we were not more up to the challenge. 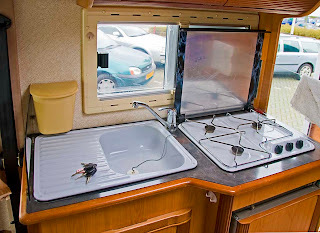 For the last couple of years we have been fortunate to have had the use of a UK based European camper van (RV) for several months. 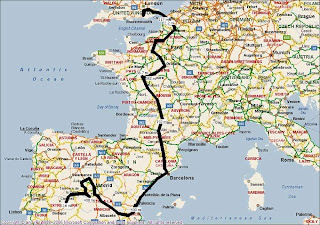 All told, between the spring of 2007 and the summer of 2008, we spent more than a third of a year traveling the highways and byways of about 20 European countries and visiting more than 100 camp sites. The only problem we've encountered to date, is that the experience is habit forming - so much scenery, so many historical sites, so much cuisine, so many shopping adventures and all this in a variety of languages. The question then became "How to organize to be able to make such visits on an as required basis". Some research and a little luck produced a possible answer - "Turner Cars and Campers" in Utrecht, NL, so off to Utrecht we went. 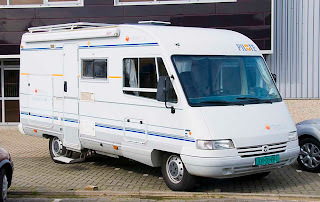 To make a long story short, after verifying how the plan works we scouted around for a suitable vehicle and quickly became the impoverished owners of a mobile holiday home in Europe. 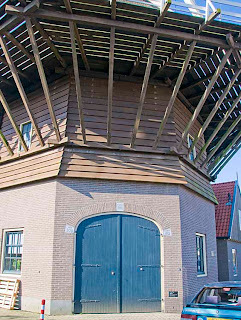 See here for pictures of "Ons Huis". Europe anyone? After a frigid day in Harwich we felt in need of a little coddling, perhaps even a lot of coddling. Our expectations of a cabin on the ferry had not been high and included greasy metal grid floors, rusting communal toilets, fishy smelling corridors and indescribable galley food. What a pleasant surprise then, that the Stena Line ferry turned out to be a mini cruise ship. Comfortable room, crisp linens, large private bath and shower, great shopping and two restaurants serving delicacies such as Steak Pie and Fries swimming in Gravy - Mmmm. Thus was our need for pampering sated. 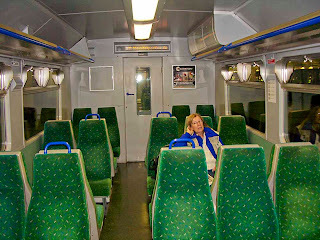 Next morning we woke in Holland, left the ferry and took a train into Rotterdam. There we picked up a car and set off into the hinterland. Although the focus of our visit was Utrecht we actually spent little time there, instead we ran around all over the local countryside and spent a whole lot of time looking for vacant hotel rooms - the whole place seemed to be buzzing. 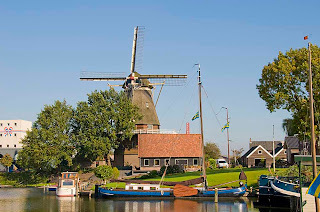 We did visit a little place called Harderwijk a couple of times and managed a quick walkabout. See here for more of this Dutch treat. 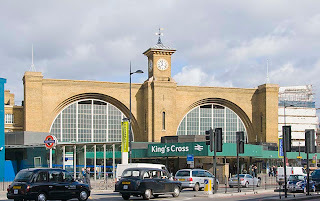 Bright and early on Friday, we boarded a bus to Liverpool Street Station in north east London, from which trains serve the 2 o'clock sector of England, known as East Anglia. About an hour and a half later, during which we reached speeds of 92 mph, we alighted in Harwich and were chastened by cold, windy and wet weather. Brr. 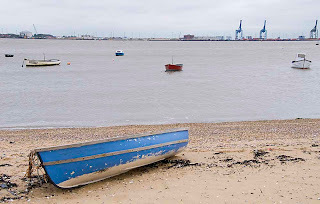 Harwich is a threadbare coastal town in the county of Essex, that provides the only significant protected anchorage on the North Sea coast between the Thames in the south and the River Humber in Yorkshire. The town received its charter in 1238, became a naval base in 1657 and was fortified with the Harwich Redoubt and a couple of coastal batteries in 1808, to ward off possible attack during the Napoleonic War. At one time an important port, Harwich, like the ports of London, was left behind by containerization and now has little more than a struggling ferry terminal. 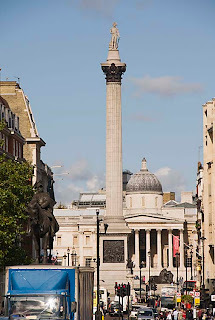 It is highly-regarded in architectural circles and is mostly under protection as a conservation area. 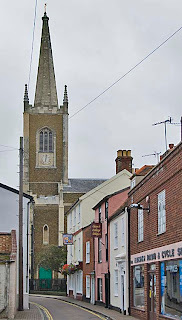 Some buildings of note include the parish church of St. Nicholas and the Guildhall of 1769, the only Grade I listed building in Harwich. The Pier Hotel of 1860 and Great Eastern Hotel of 1864 (now an apartment block) both grew out of increased traffic after the railway arrived in 1854. Click here for more. "The City" covers just about 1 square mile. This is pretty much the area walled in by the Romans in the 2nd century to protect their port and, with a small deviation here and there, the original wall line still defines the city. Prior to 1666 with its Great Fire, the area fairly bristled with churches - more than 100 of them, 97 of which fell within the walls. The fire destroyed 89 of these and, after much debate, just 51 replacement churches were rebuilt, mostly by Christopher Wren. Totaling these with new churches built in the 18th and 19th centuries, less losses due to WWII and normal attrition, today a mere 38 survive. 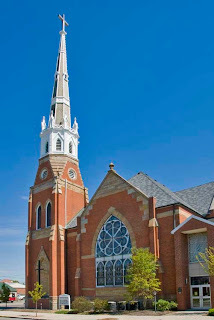 In the meantime however, the City population increased from 200,000 residents at the time of the fire, to a peak of around 400,000 from which it has steadily declined to less than 8,000 currently - about 160 potential parishioners per church. Essentially, the entire square mile has been absorbed by the financial community and every working day some 300,000 commuters pour in and out of the area. As in European cities, the protection of so many historical buildings runs counter to the needs of modernization and efficiency required to maintain a competitive business environment. In London's case at least, there exists a solution in the razing of the docklands and the development of a whole new "City" known as Canary Wharf. Hopefully, this will not soon lead to mourning for the old City. Check here for some City pics. 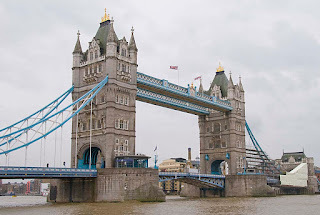 Traveling up the River Thames from its estuary in the North Sea, the first bridge to be seen is the iconic Tower Bridge, built at the end of the 19th century. 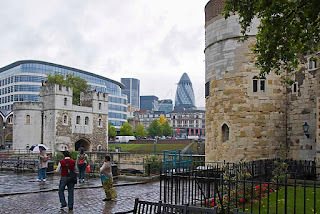 Named not for its own towers, but for its proximity to the Tower of London, one of the best known attractions in London, that graces the north bank of the river at this point. Soundly in the land of Roman invaders, plagues, fires, empire building and treachery, pirates and cutthroats, the former business center of the world, feuding royal lines and more sights per mile than anywhere else in Europe it is truly a place worth visiting. For more drivel, click here. The boat skippers voluntarily provide an interesting, amusing and frequently inaccurate running commentary in a dialect reminiscent of an uncultured version of the talking gecko seen on TV. This turned out to be a terrific bonus since so many features would otherwise have slid by completely unnoticed. If nothing else, a solid day spent on the river would be a great primer for planning future on-shore trips. 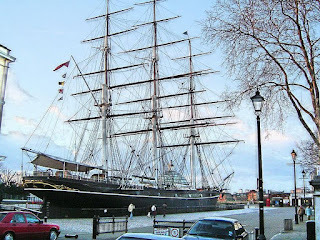 Lunch in Greenwich was a disaster with brolly breaking high winds and heavy rains, the 19th century tea clipper, Cutty Sark, discovered burnt to the ground and a heart clogging clump of fish and chips to contemplate. As soon as the next boat arrived it was back to the big city. Pictures on this page are from Wikipedia. 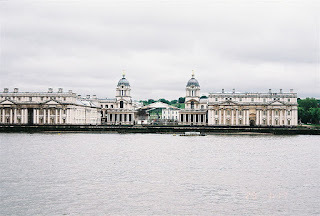 Click here for River Thames pictures. 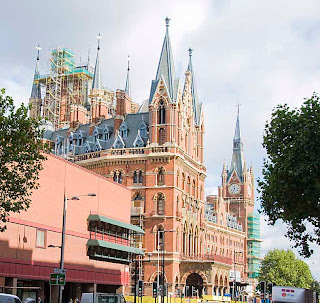 Whenever there's serious Kinging or Queening to be done in England, weddings, coronations and things like that, the Royals hitch up one of their fairy coaches and trot the 1.4 miles from the Palace to Westminster Abbey. There's a ton of stuff to see along the way so it seemed a good choice with which to start the journey home from the London Eye. Check out some of the sights here. 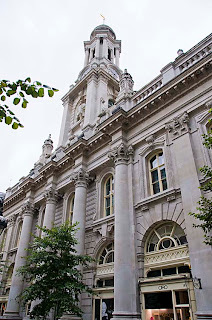 After leaving the Palace, the rest of the journey back to Marylebone passed by Green Park, Piccadilly Circus, Regents Street, Carnaby Street, All Souls Church and the original British Broadcasting Corporation building. More pictures here. The London Eye - officially the Millennium Wheel - is 443 feet high, the biggest Ferris wheel in Europe and the most popular paid tourist attraction in the United Kingdom attracting about 3-1/2 million riders each year. 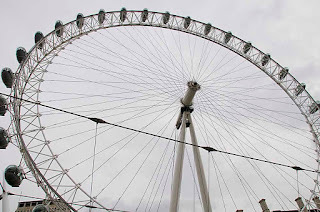 At completion, in December 1999, it was the tallest such wheel in the world but was eclipsed in 2006 by the Star of Nanchang at 525 feet which in turn was topped by the Singapore Flyer in 2008, at 542 feet. 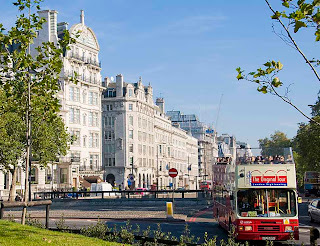 Located on the South Bank of the River Thames close to Westminster Bridge in the same area occupied by the 1951 Festival of Britain, the London Eye is catty-corner to the Houses of Parliament across the river. Thirty-two air-conditioned capsules, each capable of holding around 25 punters, are mounted around the wheel, which rotates at 10 inches per second (about 0.5mph), one revolution taking about 30 minutes. From the top, on a clear day, it is possible to see about 25 miles in all directions - click here for details. 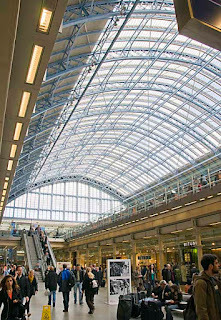 In addition to plenty of parks, London also has lots of train stations. Ignoring subway and other commuter stops there are no less than eight major rail terminals clustered around town. The Romans, who originally laid out London, built their cities with radial roads - one road for each significant distant destination. Inconveniently, this system survived the centuries and, when the railways came along, stations were slavishly built more or less coinciding with the original Roman roads. By this mechanism, the whole country is neatly chopped up like the pieces of a pie. Unfortunately, to travel from the nine o'clock sector to the six o'clock sector of the pie, it is necessary to take a train to the nine o'clock station, Paddington, struggle with bus or subway to the five mile distant six o'c lock station, Victoria, and then get the train out again. All unlikely to change anytime soon. Marian left from St Pancras Station, the one o'clock sector, to do her baby visits in Nottingham which is about halfway up the country. When she returned we met her at the same station and then went walkabout. Check here for more cheap thrills. London is well endowed with parks and commons. There are 10 major Royal Parks and over 100 other significant open spaces. It is a straightfoward matter to cross central London, from Kensington Palace to Parliament Square, without stepping out of a park except to cross a street separating one from another. 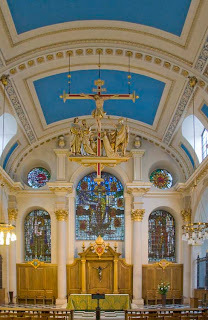 With its name derived from the small church St Mary on the Bourne, Marylebone became a popular residential district due to its location between the peaceful Regents Park and bustling Oxford Street. The 487 acre The Regents Park is just to the north with the 256 feet high Primrose Hill open space immediately to the north of that. 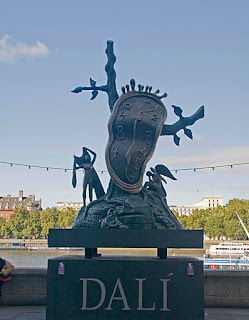 The Regents Park is home to the London Zoo and is also crossed by the Regents Canal connecting the Grand Union Canal to the former London Docks. In addition to a boating lake, the park provides all manner of sporting facilities and miles of walking and jogging tracks. See some of the sights here. Stuff's always happening. Marian's nieces in England have birthed another couple of rug-rats this year, bringing their total to six, we have discovered a seemingly low stress and economical way of becoming Euro-campers and I have to complete the involuntary task of osseointegration which takes its own sweet time. How many more compelling reasons could we possibly need to warrant a trip to check things out and while away the fall? None, we decided! Thus it was that we boarded the puddle-jumper to Chicago to meet up with the big plane that would overnight us to London. Here, a few dizzying tube rides later, we ferreted out our daughter's apartment in the Marylebone district, proving once again, that there is nowhere to hide from determined senior citizens. Now, for the next few weeks, we just had to concentrate on supporting Europe's financial crisis - a refreshing change from supporting our indigenous one back home. Hopefully, we'll have occasional Internet connection while in Europe and will be able to follow the surreal fandango of American politics, the economic Armageddon and the election melodrama. From overseas it seems a tawdry and somewhat embarrassing spectacle. Anyway, enough of that twaddle. 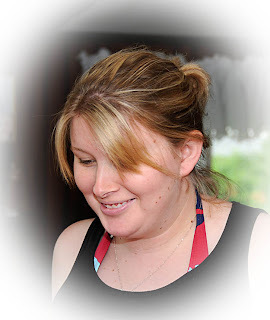 Middle daughter, Michelle, who shredded two husbands in pretty short order and is now a confirmed spinster, is on assignment as corporate attack dog in London for a couple of years or so and we seized the opportunity of having free digs in the heart of the city for a while. Marian, who has some kind of genetic weakness for ankle-biters, shortly boarded a train to Nottingham and sated her maternal needs for a few days among the horde of grand nieces and nephews gathered for that purpose. I missed this excursion on the grounds that I didn't want to go. Instead, I had to visit the London Eye, Houses of Parliament, Tower of London and a bunch of other places - a sort of penance I suppose. 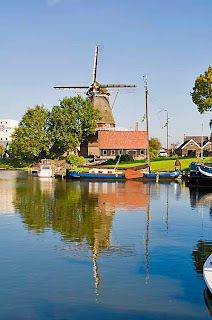 The second purpose of the trip was to check out a business we had discovered in the Netherlands that promised to resolve many of the administrative problems associated with owning and operating a vehicle in Europe as a non-resident. 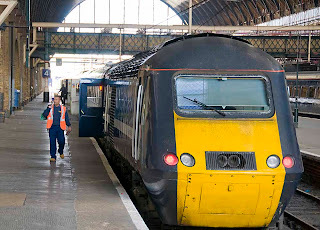 Rather than do things the easy way we had decided to take a train to the English east coast port of Harwich where we had booked a cabin on the ferry to the Hook of Holland. Upon arrival in the Hook the following morning we took a train to Rotterdam, picked up a rental car and struck out for Utrecht. Cutting to the chase, we spent a fascinating week in Holland and ended up buying a nifty little RV before hopping the ferry back to England. After that, we continued with our exploration of London restaurants, shops and other attractions. Finally, discourtesy of United Airlines, we arrived back home in the middle of the night thoroughly exhausted. Next up is the Thanksgiving get-together - more socializing than a chap can handle - so we plan to slink away on a Caribbean Cruise in December before returning home again to face Christmas. When that's finally over we will be heading south to escape the imminent cold stuff that will be heading this way. This is a tricky place to visit since there are four or five "Lisbons", each with a distinct character, architecture and personality. 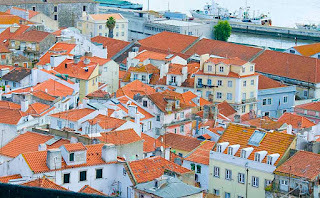 Situated on the north bank of the river Targus, about ten miles inland from the Atlantic Ocean, Lisbon is the westernmost European Capital that, including suburbia, is home to around 2 million Portugese. The major campsite for Lisbon is a about ten miles away from the gawking areas and thus a bus ride into town was required. 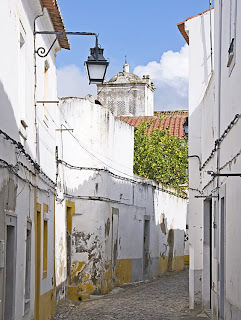 The oldest part of town is built on a hill around the Moorish Castelo Soa Jorge and is known as Alfama. In 1755 a monster earthquake flattened large areas of the city, and Alfama, that had previously been the "in" place to live, was quickly deserted by the "haves" and left to the fishermen, hookers and small shopkeepers - the "have nots". Enough of Alfama survived however, to perpetuate a Casbah ambience based on its Moorish roots. The castle has been reduced to a walled park. We trolled around Alfama quite extensively. To the west of Alfama is a small valley that runs several miles north into the hills and to the west of that is another hill. 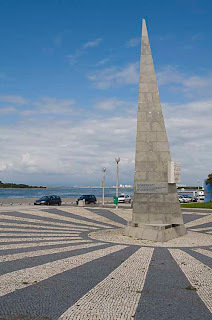 The earthquake devastated most structures in the low lying area and the Marquês de Pombal decreed an earthquake proof reconstruction of wide boulevards and a rigid grid like layout. 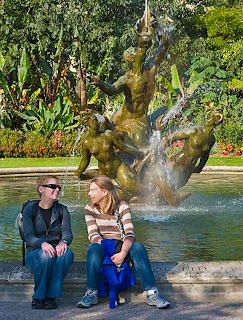 This area is known as Baixa and Avenida and, apart from a large square half a mile inland and an impressive area by the waterfront, is pretty ho-hum. 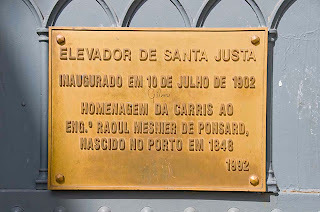 One ostentatious oddity is an elevator that transports its riders from the Baixa level up to the hill on the west side. Now there's a novel way to use up surplus revenues. 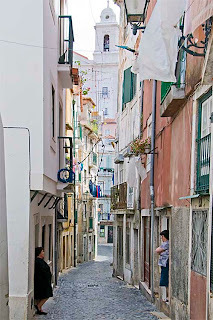 The western hill is home to "another Lisbon", this one comprising the areas of Bairro Alto and Estrella both of which were likewise reconstructed in a grid pattern following the earthquake. Finally, on the river five miles or so to the west of original Lisbon, is yet another "Lisbon", this one known as Belem. 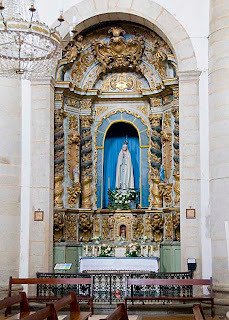 As maritime trade grew over the centuries, the original port area around Alfama and Baixa proved inadequate and the facilities were gradually relocated to Belem, taking with them many merchants and other wealthy families to build a grand upscale community. 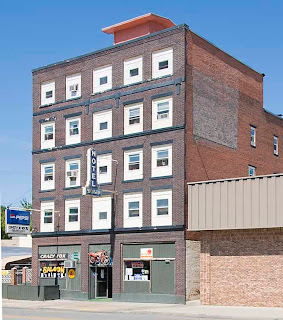 To see more sights around the area, click here. May 16, 2008 - and on to Portugal! Shortly after leaving Cáceres we ran right off the edge of Spain and found ourselves in Portugal. Not much to mark the border except a couple of long abandoned, grime covered booths and an occasional scrofulously uniformed official wandering around clutching a beverage. Certainly no attempt was made to inspect us or our vehicle so the European Union seems to be working. From our perspective, Spain had been a distinct step down from France and, as we were to discover, Portugal is about an equal step down again from Spain. Ugh! At 35,645 square miles it is about the size of Indiana and is home to 10.5 million people - about the same as Michigan - 94% of whom are Catholic. With just 170 campsites - about the same number as Indiana, which is not known as a destination state - and just 850 miles of good class highway - compare to 50,000 miles in the US - Portugal is generally scruffy, crowded, ill-organized and boasts the highest number of road accidents per capita in the whole of Europe. How exciting! 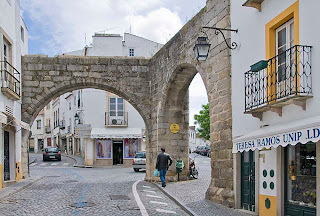 Our first Portuguese stop was in Évora, at a tacky campsite on the southwest edge of town. The visit day did not start well. After a noisy night of heavy rain augmented by a barking dog, we were preparing to cycle into the old town when we discovered that the key for the padlock manacling the bikes to Heidi, was nowhere to be found. Rats! Using available implements we finally gnawed through the industrial strength cable and then identified the whereabouts of the local Bricolage (hardware store). This was quickly added to our route for the day and off we went to buy a new padlock in Portuguese. That done, we pedaled into the old town - another UNESCO World Heritage site - and had a great day. Click here to see more. 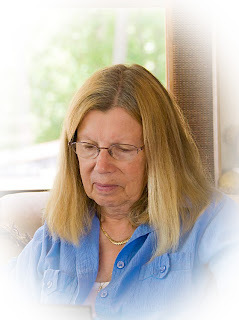 Having spent a restless few weeks in the steamy mid-west catching up on maintenance items like eye-glasses, teeth and great-grandchild worship, we realized that the year was rushing by and we had better start paying attention. We are booked into Lazydays at the start of January for yet another "final assembly" of the new coach. We haven't really driven it since we picked it up in July and have never dry-camped at all, so we needed to complete our evaluation. Thus we find ourselves in the middle of a 10 day Wal-Mart and Sam's Club tour of the country's heartland. It has been thoroughly likable so far. Today we are in the Bucyrus, Ohio, Wal-Mart Supercenter parking lot making like geriatric gypsies. According to a former editor of the Bucyrus Telegraph-Forum, the name "Bucyrus" was derived from “Beautiful” and “Cyrus the Great", King of Persia, by the fellow who platted the community. The population is around 13,000. 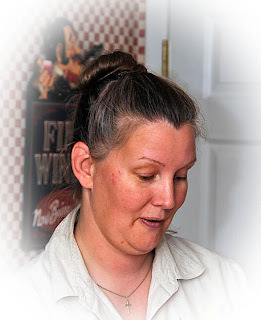 Click here for some pictures. 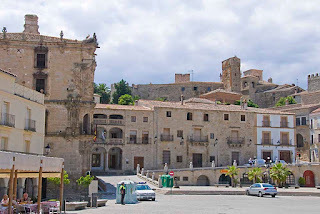 Cáceres, with a population of about 91,000, is the capital of Cáceres Province in Extremadura Spain. Founded by the Romans in about 25 BC, it seems that people have been living in the area since about 25,000 years BCE. The old town still sports most of its "original" walls although they surround a rather sterile Medieval town with few visible signs of the 21st century and even fewer signs of life. After the collapse of the Roman Empire, the city was occupied by the Visigoths, at which time it went seriously downhill until being conquered by the Arabs in the eighth century. Finally, after the Arabs had fixed the place up again, it was reconquered by the Christians in the 13th century. With its mix of Roman, Islamic, Gothic and Italian Renaissance styles, Cáceres was a shoo-in for World Heritage classification in 1986. Check out more scenes around this odd city. 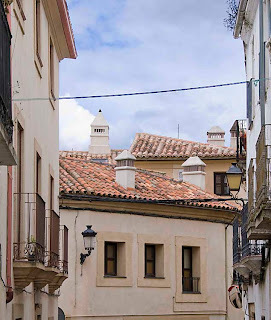 From Toledo, we continued our western trek across Spain and stopped for a while in the little 9,000 population town of Trujillo in the region of Extremadura. Perched on a hill - what else - about 1250 feet above sea level between the rivers Tagus and Guadiana, Trujillo is crowned by, guess what, its Moorish Castle built on Roman foundations. The origins of this little burg extend back 600 years BCE and of course ran the usual gamut of Celts, Romans, Goths and Moors before it was reconquered by the Christians in 1232. Despite Trujillo’s early medieval presence, most surviving monuments are from the 15th and 16th centuries. Trujillo is associated with the birth place of the Spanish Conquistadors and several famous folk were born there or otherwise have been linked to its the history. Examples include Francisco Pizarro founder of Lima (Peru not Ohio) and conqueror of Peru; Garcia Paredes, the Sampson of Extremadura founded the city of Trujillo in Venezuela; Francisco de Orellana who discovered the Amazon; Nuflo de Chavez, founder of Santa Cruz in Bolivia and so on. The legacy of the Conquistadors is evidenced in the wealth of noble monuments and mansions in the city. 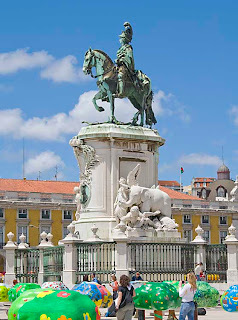 The Plaza Mayor, the city's focal point, features an equestrian sculpture of Francisco Pizarro. See here for more pictures. The first thing of course is to have offspring - these have a powerful tendency to age parents beyond their years without effort. 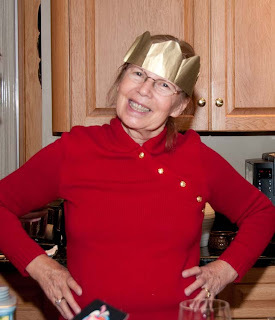 Next, before you know it, grand-kids are beginning to sprout and one thinks back to those wizened old critters who, when we were still in knee pants, would visit and insist on doling out rib-crushing hugs and jelly-fish kisses. They were of course - GRAND PARENTS - and, for better or worse, we had morphed into just that! Even though, in our hearts, we were still lusty 28 year olds frozen in time at an age when everything worked as nature intended, a glance in a mirror told the daunting truth - we had become the current day wizened old critters. After a little rationalization, things did not seem too bad, however. Grand kids have excellent petting zoo qualities - visit, indulge, leave - all without having to feed, clean or train. 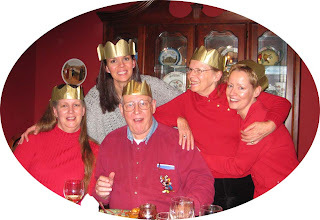 Better yet, grand kids have few reasons to hate grand parents and, from time to time, even show signs of friendliness. Not too bad, after all. But wait, there's more! 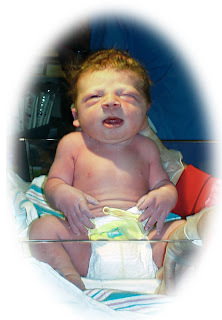 This morning at 9:07 AM EDT, great grand kid #1 was born. With three generations in attendance, mother Amber, grandmother Martine and great-grandmother Marian along with 14 hospital staff, the ranting bundle known as Henry Hall slithered into the world. Weighing in at more than 10-1/2 pounds and just shy of 2 feet tall, I was really happy that my role was limited to staying home in case the phone rang - another lucky escape! Amazing how complex birthing has become from the days when our kids were born at home with intermittent visits by the family doctor and a midwife who were tending to as many as four other births in the same day. Yesterday, there was a world wide photo-walk organized by a photographer and author by name of Scott Kelby. No big deal, just an opportunity for photo-freaks to get together and wander around town taking pictures, in more of a social humor than might ordinarily be expected from such folk. The walks were concluded by lunch at a local restaurant and pictures, worldwide, will be collected together for selection of the best. More than 400 cities from 40 plus countries fielded a total in excess of 7,000 photographers, so many snaps must have been taken! 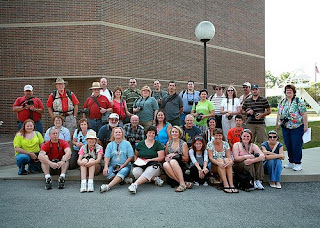 With a limit of 50 to each group, larger cities fielded several groups and, hopefully a good time was had by all. The Fort Wayne mob, shown here, numbered in the forties and, although the forecast rain did not spoil our parade, it was nevertheless oppressively hot and humid. The top picture is a statue of "Mad" Anthony Wayne, the military commander sent to neutralize the Indian threat in the early 19th century and the namesake of the city. 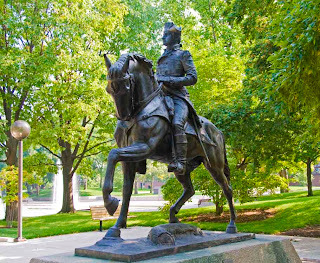 With its list of attraction (The Zoo) there is nothing much of note in Fort Wayne but now you can click here to verify what you thought you knew all along.